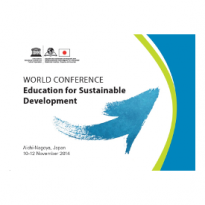 To mark the end of the UN Decade of Education for Sustainable Development and the beginning of the Post 2015 agenda activities, UNESCO and the Government of Japan will hold the UNESCO World Conference on Education for Sustainable Development - Learning Today for a Sustainable Future. It will take place on 10-12 November2014. The 2014 World Conference on Education for Sustainable Development will carry out a stock-taking of the implementation of the UN Decade of Education for Sustainable Development (DESD) and celebrate the Decade’s achievements. The Conference will showcase initiatives, actors, networks and ideas that were stimulated by the DESD. Examples of good practice from all over the world will play an important role in identifying viable approaches to ESD, as well as key areas for future action. IAU has been invited to coordinate the Workshop on Higher Education and Research together with HESI/UNEP. The global IAU-HESD Portal will be featured prominently at this event; making sure your actions and initiatives are made visible and that your concerns and other key messages are shared with IAU beforehand.